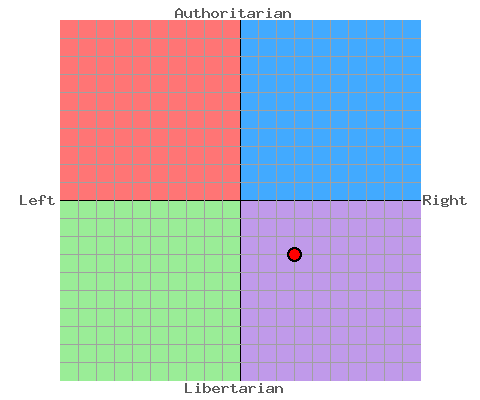 "Welcome to The Political Compass"
Interesting test on this website. There's abundant evidence for the need of it. The old one-dimensional categories of 'right' and 'left', established for the seating arrangement of the French National Assembly of 1789, are overly simplistic for today's complex political landscape. For example, who are the 'conservatives' in today's Russia? Are they the unreconstructed Stalinists, or the reformers who have adopted the right-wing views of conservatives like Margaret Thatcher ? That's about as much as we should tell you for now. After you've responded to the following propositions during the next 3-5 minutes, all will be explained. In each instance, you're asked to choose the response that best describes your feeling: Strongly Disagree, Disagree, Agree or Strongly Agree. At the end of the test, you'll be given the compass, with your own special position on it.